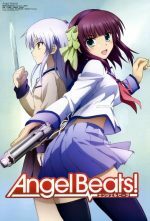 Anime Review: Vandread, Toradora!, Angel Beats! Space is vast; space is dark; and space is empty. In space, no one can hear the cries of 3 men trapped on a ship full of women. Whats worse, those three men have never met a woman before and have always been raised to hate and despise women. In the distant future, the genders live on separate planets. Men on one planet, and women on another… Yes, there are some obvious oddities in the pro-creation department, some kind of strange cloning or something, whatever, it isn’t important. What is important is that the genders don’t live together and are in-fact mortal enemies. Hibiki, a low ranking mechanic; Duelo a medical doctor; and Bart, a navigator, are all trapped onboard the Nirvana. A ship that has become a sort of living creature by two separate ships, one a male’s ship and the other a female’s ship, having been fused together by the Paksis. They are essentially captured by the women, who are pirates. Shortly after the Nirvana is flung to a distant part of the galaxy to save it from destruction from a missile attack. 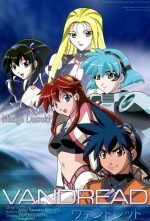 With none of the women able to pilot the new ship, having no doctor of their own and no-one other than Hibiki to pilot the Vanguard mecha, the two genders must learn to work together while traveling back to their own solar system. The series had a pretty good story line and plot. It was entertaining to watch and easily leaves you wondering what happens in the next episode. Character development is paced, meaning it isn’t slow in that you get bored but they don’t tell you everything about everyone all at once. Over the course of the series you learn more and more about each character, who they are and about their past. The usual romance ensues with Dita wanting to meet an “alien” (man) and following Hibiki around the ship trying to “learn more about him”. Hibiki isn’t interested in “that crazy woman” and just wants to be left alone. While there are some occasional “near misses” when it comes to the cleanliness of the content I would have to say overall it is pretty decent. Honestly I would say the worst is the season 1 opening (or maybe it was the end credits) which has some suggestive content made. The dress of the female characters is rather sparse for some of them, but unlike many shows that is as far as it goes. The clothes stay on. I would call it “beach safe”, meaning you are going to see worse at the beach… or depending on where you leave you might see worse at your local mall or grocery store. Content: Mostly clean, call it teen safe. Wow what a great show! All I can say is this is totally worth watching. Like nearly all Anime shows it is has a plot that follows your usual boy and girl should get together and everybody knows it. But they took that plot and spun it into an incredible story that will leave you laughing, confused, thinking “yea, thats something stupid I would do/did”, frustrated and sorry for various characters, screaming “why! ?”, and sometimes just downright dumbfounded at what is going on. The story follows Ryūji and Taiga, two misfits in school. Neither one has very many friends. 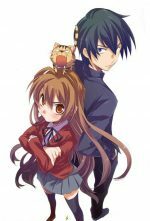 Ryūji is seen as a scary guy do to his face; and Taiga, known as the “Palmtop Tiger”, lives up to her name as a short girl with the tenacity of a tiger. A handful of friends joins them throughout the show as they help each other find happiness, and sometimes torment each other just because they can. To say that this show includes a love triangle would not do it justice… I’m not entirely sure which geometric shape is the right one, maybe a hexagon? As I said, there are episodes that will end and just leave you thoroughly confused because you don’t have a clue as to what is going on anymore. There is one episode which has a short questionable dream sequence that lasts about 15 seconds. Nothing is actually shown, in the dream Taiga is holding a towel or blanket or something over her body but leaving her sides exposed. Again nothing is ever actually shown. The whole team did a good job on this one of not taking the liberty to do any quick fan service even though they could easily have slipped some things in. If you enjoy Anime that makes you laugh a lot at various antics or even downright stupidity you should enjoy this one. Clannad was a great show for telling a solid story. While Toradora! (loosely translated as Tiger Dragon!) has a pretty solid story it’s truely charming aspects come from its ability to build up a lot of tension and then suddenly let it lose with somebody doing something stupid, or just showing up at the most inopportune time. The show itself did not make much use of music inside the show, at-least nothing that leaves a memory, the opening and ending themes (there are 2 each) are pretty catchy. In addition to the episodes in the main plot, there is one OVA and 4 “shorts” that I have yet to watch, meaning I cannot attest to their cleanliness – though based on the main episodes I don’t imagine them to contain anything bad. Imagine a world that has been created especially for kids who never got to life a full life. Imagine a world designed specifically for kids to get a chance to life that full life. Imagine a world with no adults. Imagine a world full of dead teenagers who are not yet ready to be reborn into the real world. A world where they can life a normal life. A world where they can be the kids they never got to be when they were alive. That world exists. That world is governed by Angel. And that world. That world has rebels. Youths who have rejected that they must live a “normal life” and then get obliterated from that world. Youths who have decided to stay there forever. Youths who are rebels against the God. No, I don’t believe in reincarnation, nor do I believe that such a world exists. But this show proposes an interesting concept. What if there were an in-between world that helped us come to grips with never having had a chance to really live life as a kid when we were alive? What would we do with that chance? What if we didn’t know what would happen to us when we vanished from that world? Would we want to leave or do anything we could to stay? Would we fight against an Angel? Would we fight against a God whom we believe has turned his back on us? This is not a philosophical show. It does not set out to really explore those possibilities, nor do I believe it sets out with an agenda to alter any beliefs you may have. It sets out with a premise and a few assumptions and creates a world. A world in which they can tell a story. A story that will make you laugh. There is not a lot of sadness in this story. There are a lot of “oh no that did not just happen” moments. It’s a clean show with a good plot. I mentioned Clannad above and I will mention it again here. Clannad is probably my single most favorite Anime thus far. I would have to put Angel Beats! in a close second. It is, sadly, short. Too short at only 13 episodes. But it tells a great story. I will say while the content is clean it isn’t exactly child safe. Remember I mentioned the whole rebels against the God thing earlier? Well this story revolves around a group of kids who have decided they are not going to just be good kids and get obliterated from this world. They are going to fight back. Nobody actually dies (heck, they are already dead right?) and they don’t really do anything gruesome… okay well scratch that. They don’t really do anything over-the-top bloody gruesome. The first episode probably has the most gruesome thing happen that is visualized on screen, which a sword through the gut. I don’t have kids so I can’t really say how I would feel about my kids watching it if they were young, but I would again say teenagers no problem. They probably has seen more gruesome stuff at their friends houses or at the movie theatre.